What’s all this compound stuff about? It’s little games, I actually read this is something I plan to talk about. I recently read a post by James Clear, who is a great blogger. He was referring to the British cycling team. Now in cycling sorry about you non-sports people but this was all appropriate because of Great Britain. We’re not called Great Britain for nothing we have Great Britain’s. Sir Bradley Wiggins, our wonderful hero cyclist broke the one-hour distance record where one man on his bike inside the velodrome just cycles for one hour to see how far he can go and he just tries to go further than anyone else. Can you imagine that flat out for one hour? He beat the record, did about nearly 54 and half kilometers, which is a 30 something miles. Absolutely mad for an hour, try it for five minutes can’t even do that. Anyway the British cycling team of which Bradley Wiggins was one, and by the way in Britain we don’t really do the drugs thing. Certainly not in cycling. It’s kind of British things it’s not necessary. It’s just a cultural thing that’s banned. Some cheats here and there. Just trust me, it’s not really the done thing and I know what you’re thinking. Yeah well the others, Lance Armstrong etc but no, not Bradley. Anyway, his manager took over the British team was Dave Brailsford . He looked at British cycling and decided to improve it. We were pretty average and he brought in little compound changes and this is the crux of James Clear’s post talking about Dave Brailsford . He looked at everything. Most people would think, let’s train harder, let’s train longer, let’s do this. He looked at everything. He even changed the pillows that people sleep on. So they’d get a better quality sleep and they take the pillows wherever they go. They changed bits on the bike; they would shave of little bits of the tire. They would change the position that they do, they changed the food they eat. They changed the times they eat. They would test everything and all these tiny increments add 1%, 1% here, 1% there, 2% here, 2% there. On their own individually they do absolutely nothing. They’re imperceptible and wouldn’t notice but over time, given time one at one at one at two yeah starting to add up? 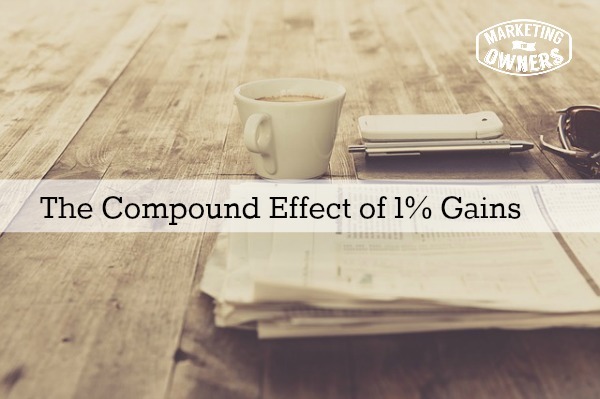 If you know the compound effect add 1% to 1% doesn’t equal 2. It adds 2 point a lot one I think, sorry mathematicians if I got that wrong. But it adds up. All these things can be applied to your business, every little thing. So for example, your website — a slight tidy up of the website logo. Your phone number — changed to a free phone number or a toll-free number. Your email system — change it to Google Apps, slightly change the signature, make it more user-friendly. Change the way you answer the phone, change everything that you do and make notes of it because every little thing will add a compound difference. No one will notice. It will be imperceptible but add it up. Over time you will suddenly find that your customers think you are a lot more professional and they will buy more from you. Seriously, this will work. There are two books I would recommend; Jeff Olson wrote “The Slight Edge” this is all about it as you can imagine and also Darren Hardy the owner of Success Magazine wrote “The Compound Effect”. Now, heads up there. I know everyone who read the “The Slight Edge” loves it. I haven’t read it. I do own The Compound Effect. “Slight Edge” is on my list. My list is kind of long. I read a lot of books. But the compound effect is brilliant and it was based on “The slight Edge”. Darren Hardy is fighter. This stuff works, just little things he even did it to finding his wife. You’d have to read the book. It’s not as bad as it sounds and he’s got a good wife, great marriage but he applies it to everything. He’s a very thorough guy. 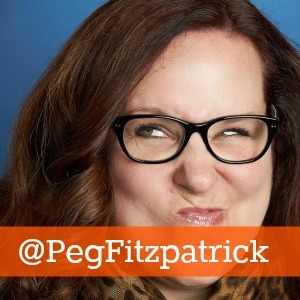 Today for the friendly follow, I recommend Peg Fitzpatrick. Her website is PegFitzpatrick.com. She is a social media strategy expert. She works a lot with Guy Kawasaki. When I say follow her on twitter, again, learn from her, see what she does and how she applies it and everything. And when people are good on social media, you’ll find they’ll be good on Facebook, they’ll be good on LinkedIn probably, they’ll be good on Pinterest, and they’ll be good on Instagram. You get the idea but also check out their blog, have lots of helpful information. Peg FitzPatrick is well worth time and effort to follow. What are some things you need to change?